I hope that you’re enjoying sewing along with the Quilt Block of the Month Series here on the Polka Dot Chair Blog. 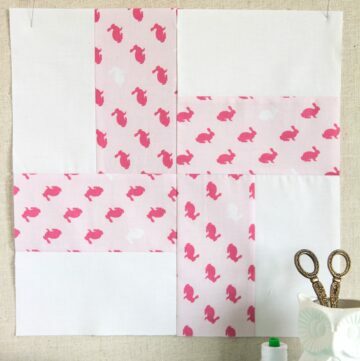 I know that many of you are new or somewhat new to quilting and thought that I’d take some time and write up some Quilt Block Construction Tips. 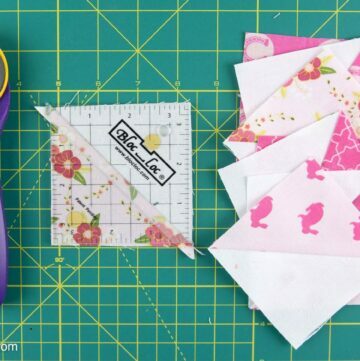 These are just little things that I have found that help me when I’m quilting to stay organized and create more accurate blocks. You can CLICK HERE for an index of all of the posts in the Block of the Month Series. I’ve loved reading your feedback as you’ve been stitching your way through the blocks for the Block of the Month series. 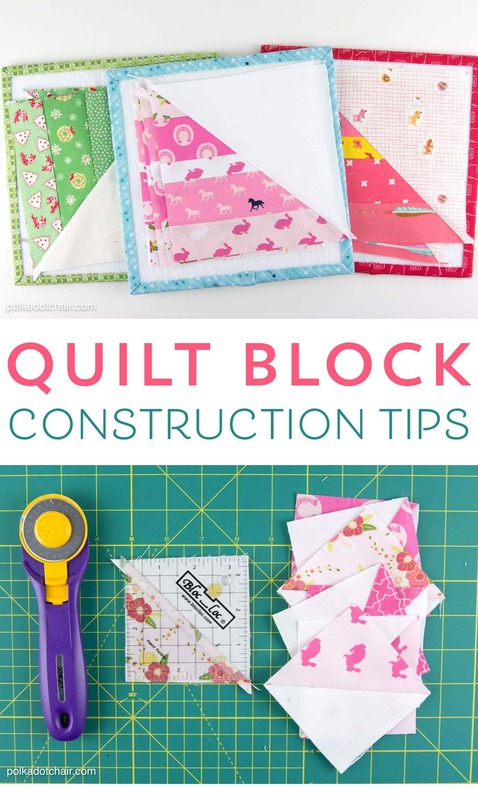 I’ve noticed that several of you have had some of the same questions so I thought I’d take a minute and address some of the most FAQ and share with you some of my favorite tips for construction quilt blocks and staying organized while I’m doing it. All of the products mentioned in this post I purchased myself. I have included a few affiliate links if you’d like to know where to buy some of them yourself. You can also get most of them at your local quilt shops. Let me tell you a little secret. I’m sitting here typing out this post and looking at a drawing of the completed quilt after all of the blocks are finished. Yep, they are all designed, and I’m so happy with how the quilt is going to turn out in the end (I hope that all of you are too). Of the remaining 8 blocks (I’ll probably throw in a few “bonus” blocks too incase you want to change one out) 7 of them use HST’s. 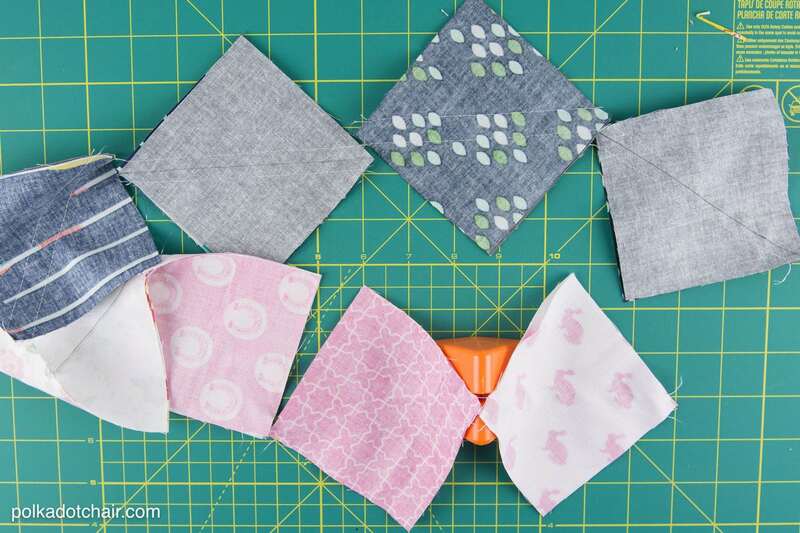 These are one of the basic building blocks of quilting. 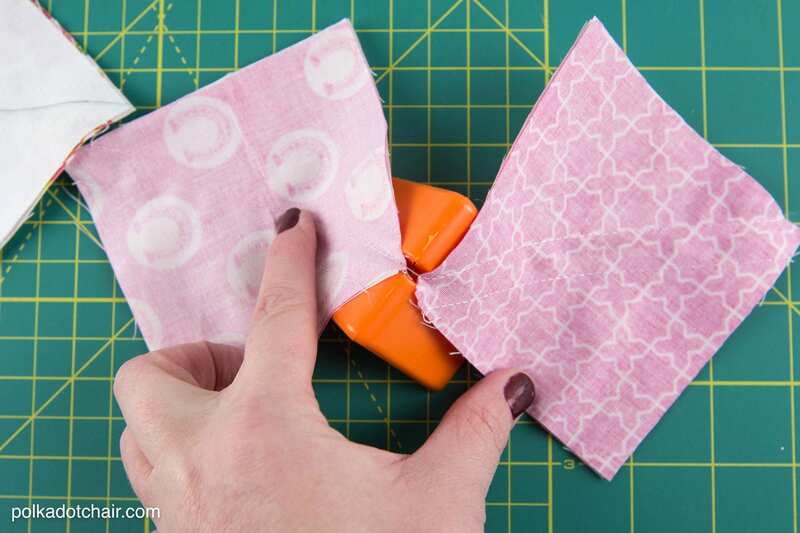 They may seem tricky at first but as you get sewing them you’ll realize how simple and quick they are to make. One of my favorite tips when making HST’s is to chain piece them. Pin and mark all of your blocks at once. Then feed one block through your machine and stitch. When you’re almost to the end of the fabric put the next block on the machine and let the feed dogs catch it. Then just keep sewing. Keep repeating until you’ve sewn all your blocks. After all of my blocks are sewn I like to use the cutting tool to quickly separate them. (I can’t find the exact tool pictured on Amazon, but this one is very similar) It has a little blade and you pretty much just pass the block through it and it cuts it fast. The next tip I have for you is regarding trimming (or squaring up) the HST. There are two ways that I like to do this and both involve specialty rulers. 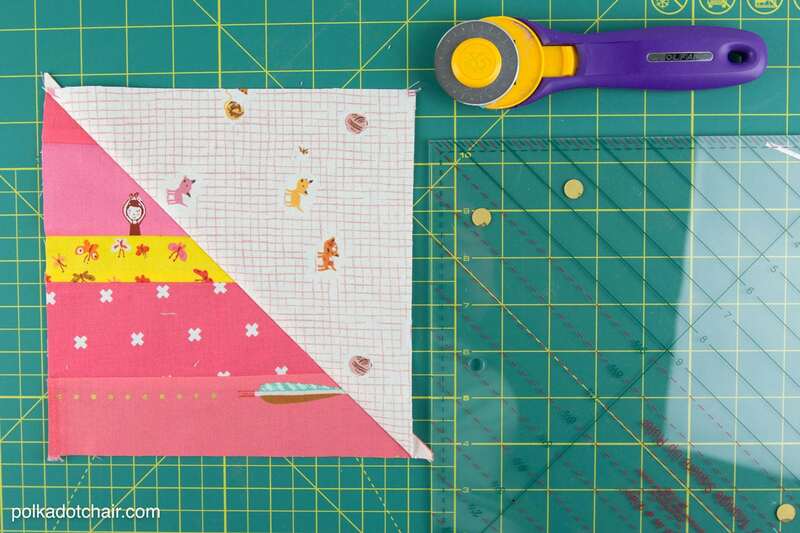 The first one is the Quilt in a Day Triangle Square up Ruler. I have the 9 1/2″ one. After you’ve stitched both sides of your HST and cut it into two pieces BUT before you press it open you will use this tool. It has markings on it every 1/2″. Simply line up your seam with the desired mark. For example if your HST should be 8″ square line it up on the 8″ mark. 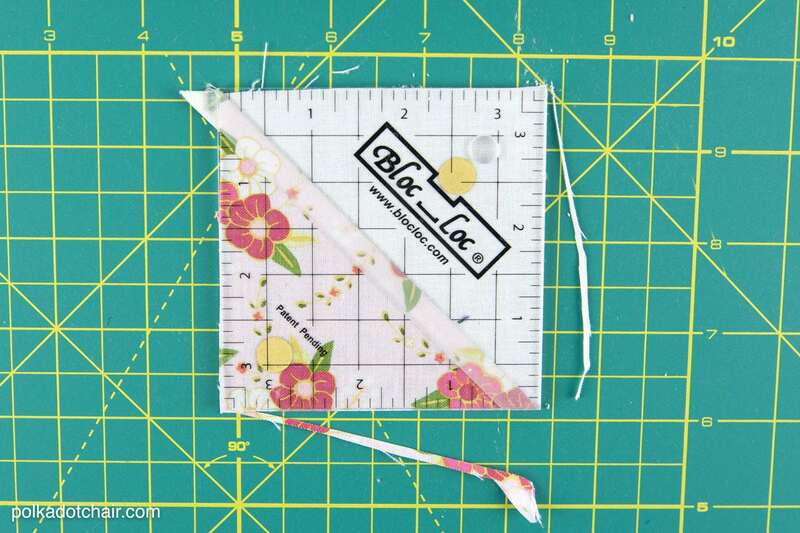 Make sure that the block is centered under the ruler then trim both sides. After that you can open up and press your block. The downside of this ruler is that it does not trim off the “tags” on the ends of the block. You’ll still need to snip those off before you move on. The next ruler that I like for trimming HST’s is a Bloc-Loc Ruler. These rulers have a groove down the center that “locks” onto the seam in your HST to keep it from moving around as you trim it. It ensures that the seam between the two fabrics stays on the diagonal. I like to use this ruler with a rotating cutting mat. Then I don’t have to move the ruler after it’s placed on the fabric, I just rotate the mat. The downside of these rulers is that they only come in 1/2″ measurements, so if you want a 4″ HST you’ll have to use another ruler. You also need a different ruler for each HST block size so the cost can add up. I’ve noticed that the smaller the HST the more essential the ruler is. 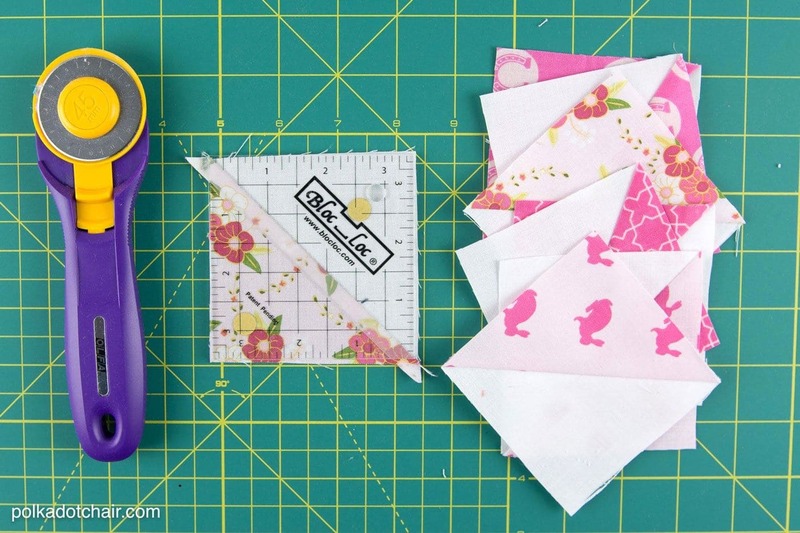 Those smaller blocks can be so hard to trim up and this ruler really does help with that. 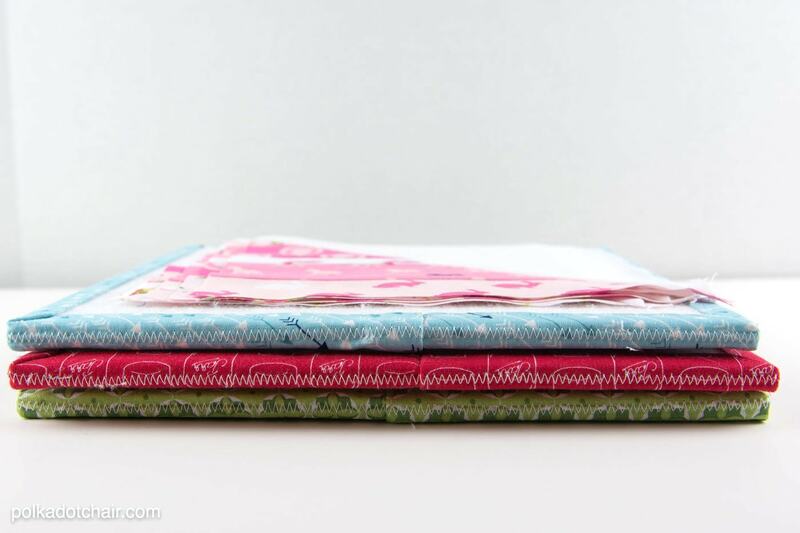 For more HST tips you can check out this post that Amy over at Diary of a Quilter wrote. She’s the one that introduced me to the Quilt in a Day Ruler. I find it quicker to cut out all of the fabric for my blocks at once, then sew them all at once. 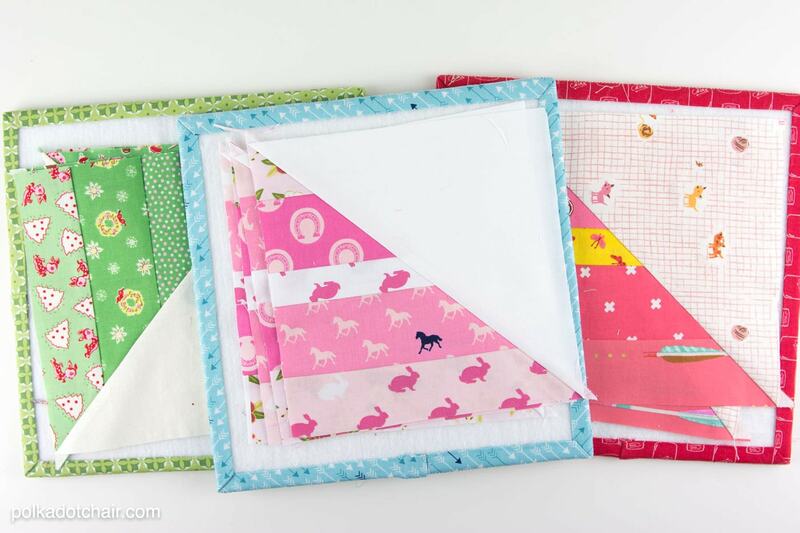 To keep all of the pieces for each block together I’ve started using these design boards from Lori Holt. 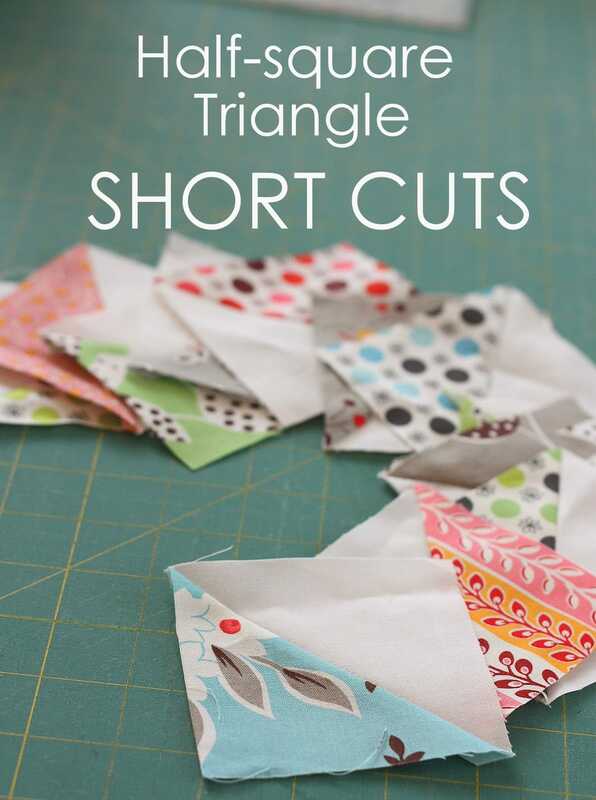 You can make them yourself with THIS tutorial or you can pick up a set at the Fat Quarter Shop. I cut out each block and lay all of the pieces on the board. I just stack them up as I work. Then move the board back and forth with me from my machine to my ironing board. Keeps everything straight so I don’t accidently piece the wrong strip into the wrong block. When I’m working on a large project, like a quilt, I like to pull all of my fabric at once. I put the fabric into a canvas bin and label it. I then also put all of the scraps from the blocks in that bin. Many times when I move to cutting out the next block I can use some of the scraps from the previous block. 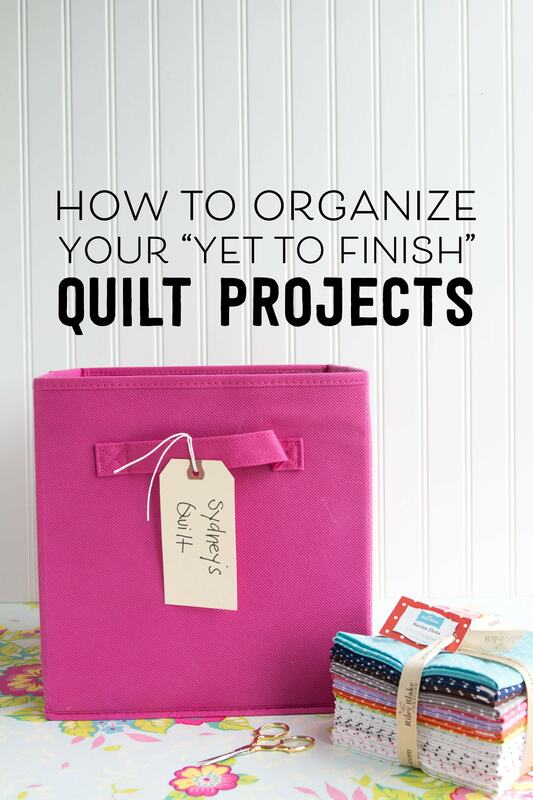 If you want more tips on how to organize your “in progress” quilts you can check out this article I wrote for eBay. I’m excited to be working with them this year to build up some of their sewing and quilting content. So tell me, what did I miss? 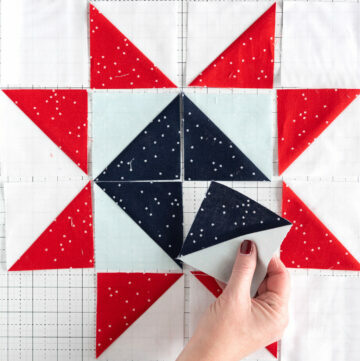 Do you guys have any quilting tips to share with everyone? Just leave your response in the comments section. Oh THANK YOU for the tip! 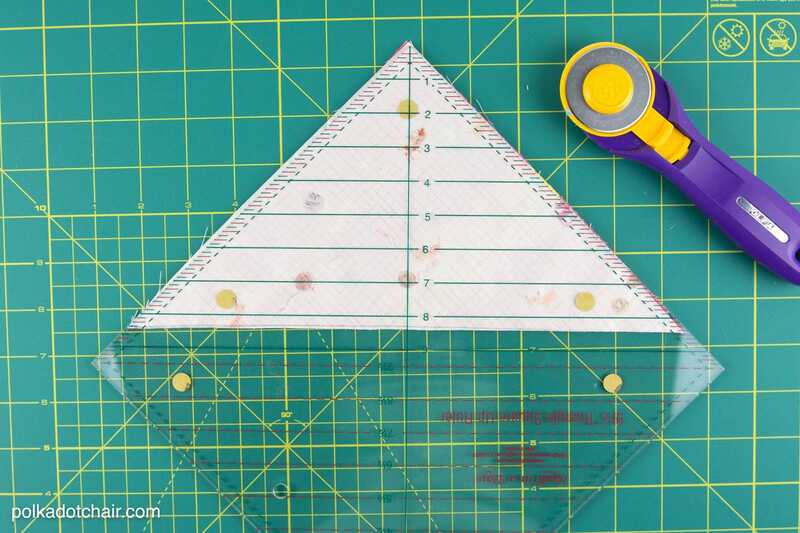 I never knew to try it that way and always had a hard time using my cutting mat. Thank you for sharing it with everyone! I see that you are finishing each block as in a pot holders. Are you putting the finished block together at the end??? Yes, I’m making 4 quilts, each with 12 blocks. some will have sashing and some won’t. Wow! Melissa! You’re really good at organizing stuff. I like it when you put everything in order. Melissa – YES Lori Holts “design boards” are VERY helpful – it took me a week to make 7 – but now they are worth it. I too love the “lic-bloc”…tools make the project come together faster! Melissa, I just wanted to say that I think you are pretty amazing. Thanks for inspiring me to finally get up the nerve to try quilting. You rock! 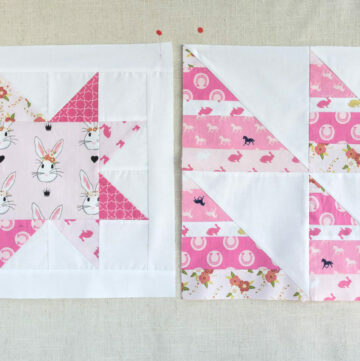 I have been looking everywhere for an answer to this question : when sewing 4 half-square triangles together, how do you do it without having a massive lump of seams in the middle? So helpful! Thanks for the tips and links to the other articles.